It’s National Nacho Day! 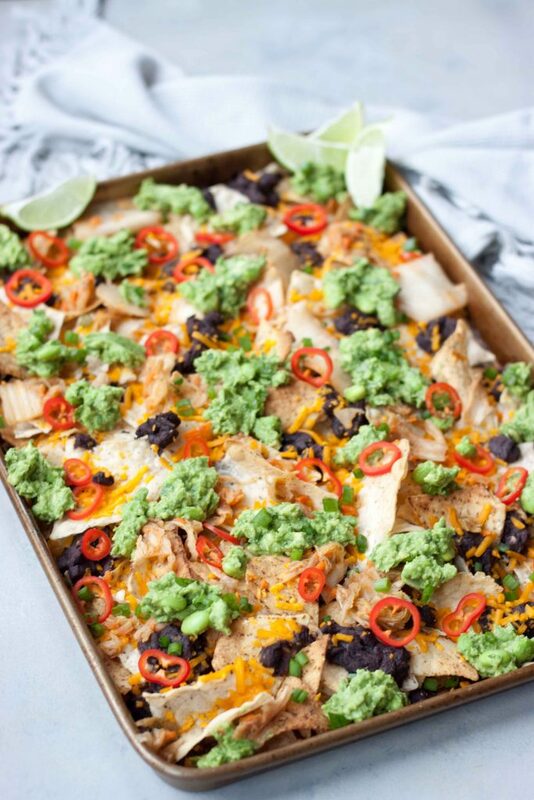 These Vegan Kimichi Nachos are nacho average nachos! We love our nachos so of course we have to celebrate this foodie holiday. Since it’s also Meatless Monday I thought it was a perfect opportunity to come up with a healthy and different twist on the classic. Hey don’t you worry we still kept them delicious but with a couple tweaks they have health benefits, just in case you need a reason to justify eating nachos. Loving these Vegan Kimchi Nachos I did make them again with my favorite local Way Better Sprouted Sweet Potato Tortillas (ones mentioned below in this recipe) to share at event Super Bowl Weekend. As I’m updating this before I’m going to leave it at that and just add this picture since I’ll be posting again before the event on social media. More to come. I was going to go with a sweet potato nacho but hey I’ve done that and seen them all over and if you’re like me when you want nachos you want tortilla chips, as much as I love sweet potatoes they just aren’t the same. So in my perfect world I pretty much need only a couple things for nachos, tortilla chips (I realized this one even more when I recently ordered tator tot nachos), beans, flavor so usually salsa, and guacamole. Lots of guac! The rest I could probably take it or leave it. While having avocado toast with kimchi it just came to me that I needed Vegan Kimchi Nachos, yeah don’t ask I don’t know either what goes through my mind sometimes. So basically swap salsa for kimchi. Since my Asian Guacamole is a perfect pair for it I use that. A few sweet red peppers for crunch, not the same kind as the chips but you know that fresh veggie crunch that makes you feel better about eating the salty crunchy loaded tortilla chips. Pretty much the reason I think they put the shredded lettuce on top of nachos. Haha. Watch as these nachos disappear!! I have a few favorite tortilla chips and this may have been the hardest decision for me when it came to these Kimchi Nachos. I love Way Better Sprouted Tortilla Chips but the two I have always on hand are are flavored and I didn’t need more flavor here but and should have grabbed more Sprouted Sweet Potato Tortilla Chips , I also like Siete Tortilla Chips but they don’t usually hold up to well to heavy and wet toppings but I was really craving them. So I solved the problem and added more of a probiotic punch to the nachos adding some new Kraut Krisps, plus the first ingredient is veggies so that pretty much means I’m getting more chips without really adding chips right? Probably best to mix them anyways as one doesn’t need too many probiotics and beans, you may have one confused gut, enough said there. YOU can use any tortilla chips YOU want, just throwing out here what I made this time. I made them again and used all regular tortilla chips as I was out of the other ones and they are still just as good. I did add some cheese here, dairy free So Delicious Cheese, and I really wanted to use the Cheddar Jack again but they were out. I think I like that a little better than cheddar on the nachos but again it’s up to you and you can use your favorite and what you have. Again I like share my crazy ideas and encourage you to think outside the box and give you new ways to enjoy some of your favorite foods or try some new ones. Same goes for the quantities, I HAD to make these again to measure because really who needs to measure toppings to make nachos, it’s like building a sandwich and it will turn out either way. Love guac, pile it on!! These nachos are so quick and easy to make you can make them for dinner tonight as they are also perfect for Meatless Monday! 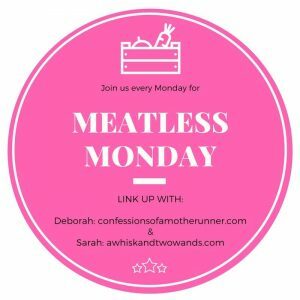 It might be National Nacho Day but it’s still Meatless Monday too. My co-host Deborah and I can’t wait to see what’s cooking in your kitchen and hope to inspire you with some marvelous meatless recipes below! 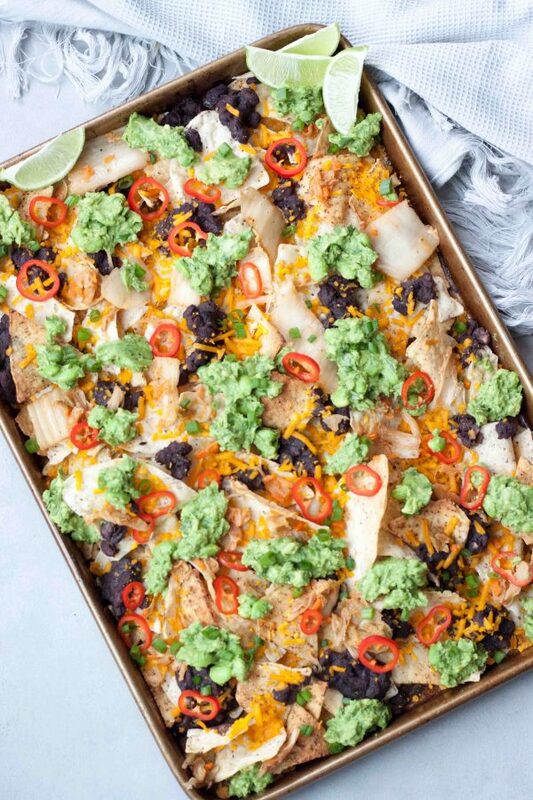 A flavorful twist on classic nachos Vegan Kimchi Nachos also pack a healthy probiotic punch! Gluten free and vegan friendly these quick and easy nachos are great for dinner or your next game day party or snack! Preheat oven to 400F. Spread chips out on a rimmed baking sheet, line with foil for easier clean up if desired. Drop spoonfuls of beans over the chips and sprinkle cheese over them. Bake for 10-12 minutes, until cheese is melted (depending on cheese as some dairy free/vegan ones don't melt as well as others) and chips are golden. While chips are baking prepare guacamole or any other veggies and toppings. 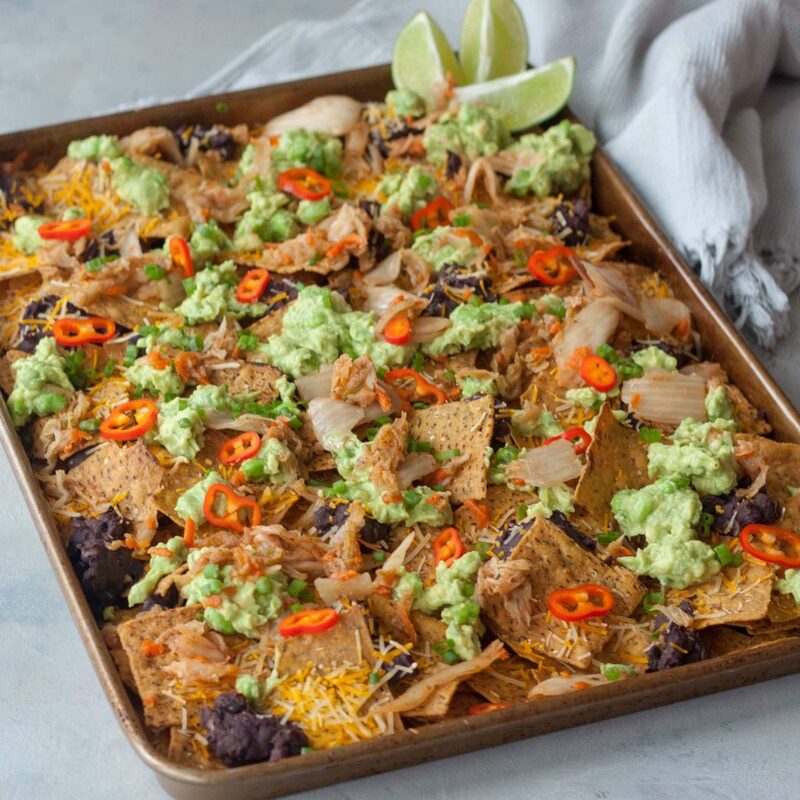 Remove from the oven and top with guacamole, peppers, kimchi (use a fork or slotted spoon so you don't make your nachos soggy), green onion, and any other additional toppings as desired. 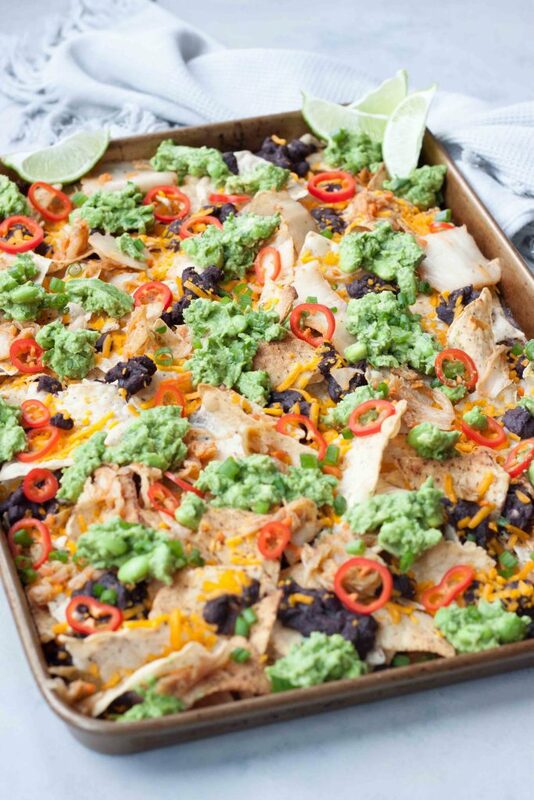 Love this creative twist on nachos! They will disappear fast for sure! Such a creative twist on nachos! They look delicious! Who doesn’t love a great nacho plate? This one looks wonderful! These sound super delicious! Nachos are the best! Obsessed with kimchi and nachos, so I can only imagine that these would be DELISH! Also love that they’re vegan. Yum! Ok now I have two recipes to try! These nachos as well as the avocado toast you mentioned with the kimchi. So good! I’m all about this! My partner loves kimchi!! Yumm! Have to try this recipe! I’m mesmerized by your little nacho gif, lol! These look delish. I never would have thought to use kimchi on nachos! What a delicious combo! We’ve been into nacho lately, but I hadn’t even thought to go Asian with the guacamole, let alone the other toppings – how fun! Oh man, I love a good plate of nachos…but they’re usually SO unhealthy. Now I can use this recipe and be guilt free! These look soo good! Thanks for sharing! Oh my. This looks sooo good! I’ve never had kimchi before so I’m going to have to try this for sure. I’ve never even bought kimchi! But this looks super tasty and inviting. I am a kimchi junkie. This is a genius idea!!! Oh wow, I’ve never heard of kimchi nachos, how interesting! Kimchi has been hit or miss with my taste buds as of late but it’s time I try it again. I’m convinced if I keep trying it I’ll end up loving and craving it (like I did for sushi). This recipe looks and sounds so interesting, I’m going to have to try it!